Identifying and discussing existing or perceived grievances that underlie the conflict in South Sudan can aid in finding a lasting solution to the conflict. Grievances in South Sudan are multilayered and a solution addressing one layer of grievances is insufficient; there is a need to dig deeper as doing so allows for the emergence of more inclusive and broader solutions. 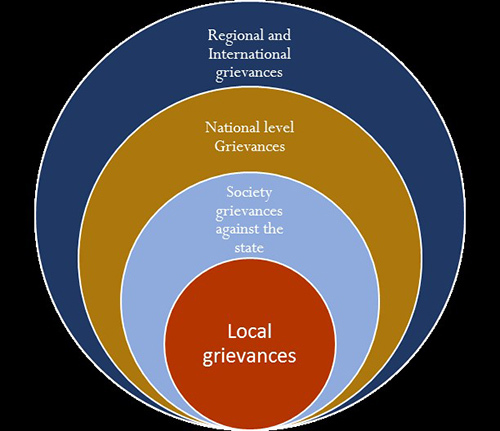 The Sudd Institute has developed a diagram depicting layers of grievances in South Sudan. At the outermost circle, there are international and regional grievances. The three innermost circles show the layers of conflict internal to South Sudan. We discuss each of these layers in the next section. It may appear odd to include international and regional grievances in this discussion focused on South Sudan. However, even issues that appear exclusively national involve international dynamics. In South Sudan, there is a subtle or perceived tension between the Troika (US, Norway, UK), the West, and the East (China). While the tensions do not play out in the open, they do influence the way these countries look at the conflict and the actors they engage. They might choose to engage those actors that speak to their interests more, for example. Moreover, the international community is alarmed that South Sudan is failing despite all the resources invested in the country. The United States, for example, wanted to build South Sudan as a model to represent its diplomatic success in Africa. The failure of South Sudanese leaders to build inclusive democratic institutions and the relapse to civil war, coupled with pervasive human rights violations, dire humanitarian conditions, and donor fatigue form the basis of the major grievances from the international community. The increasing threats against journalists, the closing space for freedom of expression and assembly, and the arbitrary arrest of individuals without due process form the other layer of international grievances. Lastly, there are genuine international fears of the threat of violence spreading to the region and undermining international peace. At the regional level, the threat of the South Sudan conflict spreading into neighboring territories has those countries frightened. Neighboring countries such as Uganda, Kenya, and Sudan are legitimately nervous about the taxing effect the influx of refugees has on their economies and security. There are also worries in countries like Sudan and Ethiopia that the instability in South Sudan could give rebels a space to launch attacks against them. More importantly, the instability in South Sudan is hindering regional economies and many countries, Uganda for example, experienced a decline in their GDP, as a direct result of the South Sudan conflict. The impact of the conflict is felt when citizens from those countries lose their businesses or employment opportunities in South Sudan. The volume of trade declined between neighboring countries and South Sudan as conflict closed business opportunities and diminished the purchasing power of South Sudanese people. All of this led to lower demand for imported goods. 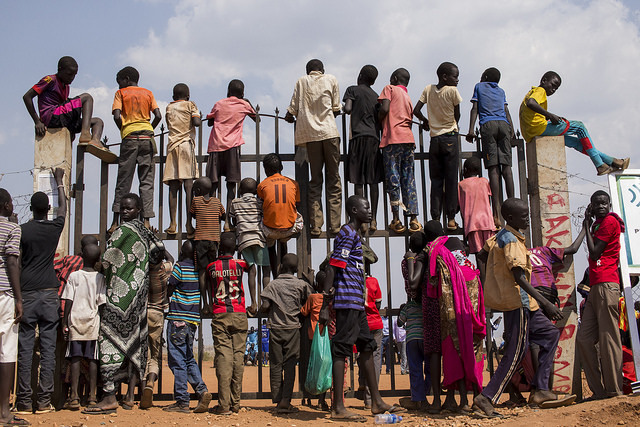 Many well-to-do families from South Sudan have migrated to neighboring countries, creating a stress on policing, housing, health, and education services, which are already limited and overstretched in those receiving countries. South Sudan’s conflict has disrupted, to a certain extent, regional integration plans both for the East Africa Community (EAC) and the Intergovernmental Authority on Development (IGAD) countries. The slowdown in regional plans means that economies of scale and other integration benefits have to be delayed. This also has an impact on the African Union’s 2063 Agenda, which hinges on the expansion, integration, and development of regional economic communities (RECs). All these grievances influence both the behavior and attitude of regional and international actors in terms of their perceptions about the conflict, and the selection of actors they engage. Such attitudes also influence the actions of South Sudanese parties toward the conflict in terms of perceived incentives or disincentives from the national or regional actors. At the political level, feelings of betrayal among the Sudan People’s Liberation Movement (SPLM) leaders form the outer layer. This was, in fact, the immediate cause and trigger of the ongoing conflict. One of the main political grievances in South Sudan is the lack of clarity of the rules of political game. At a national level, lingering divisive issues linked to resentments emanating from unaddressed historical legacies of previous wars exist. For example, the 1991 SPLM split remains a bitterly divisive issue where those whose relatives were massacred, and villages destroyed still seek justice, but the pathway to justice remains doubtful. The country is also struggling to come to terms with the bitter memories of Kokora (re-division), the mass eviction of citizens in the early 1980s. Further, the massacres of 2013 and 2016 and existing perceptions of unjust and unfair distribution of wealth exacerbated grievances. These issues play out in the backdrop of extremely weak institutions of governance in the country. These grievances form the top layer of the national issues. Another layer is the state-society relationship, defined by many unfulfilled promises. The state simply forsook citizens and reneged on most of the liberation promises. Not only did the state fail to deliver the dividends of liberation, but it also failed to do the very minimum of state responsibilities—providing security and protection to citizens and their property—but rather acted as perpetrators of violence against the population. By forfeiting these responsibilities, the state also comes short in maintaining unity and in building a cohesive nation. In the heat of conflict, the democratic space in South Sudan significantly shrunk and many citizens have been arrested arbitrarily, silenced through subtle or direct threats, the media is restricted, and the right to freely assemble and engage in political action is severely curtailed. The recent arrest of Peter Biar Ajak is a case in point for the repression of freedom of expression. Another case is the death of Isaiah Abraham in 2012. These are fundamental grievances of the society against the state, which demand rectification in order for the country to meet the tenets of a social contract. Lastly, there are grievances linked to social cohesion. These are the grievances at the local level and they simply play out when people in different communities interrelate. For example, there are issues of child abduction and cattle raiding where members of one community invade another community to steal children and cows. Quite often, people get killed and properties are destroyed during these raids. Perceptibly, such practices create acrimonious relationships between communities and retaliatory actions tend to escalate and perpetuate these incidents into large-scale episodes of violent confrontations. This explains why it is difficult to address violence in South Sudan. Given that state is largely absent, communities sometimes have no recourse, so they resort to repeated episodes of violent confrontations. Our objective in discussing these layers of grievances had been to inform both policymakers and mediators of the South Sudan conflict about the structure of the problem. Our hope is that such understanding aids the crafting of a sustainable solution. The second motivating factor for this post is to contribute to an existing knowledge about the nature of conflicts in South Sudan. When such knowledge is produced and made available, it might assist analysts and researchers to properly contextualize their analyses. Having established grievances in South Sudan are multifaceted; we recommend that any solution to the South Sudanese conflict be multidimensional. Abraham Awolich is a Senior Policy Analyst and Director of Management and Administration at The Sudd Institute in South Sudan. The Sudd Institute is a member of the Southern Voices Network for Peacebuilding. See Anke Hoeffler (2011), Collier and Hoeffler (2004) for this debate.